Hot Chocolate with the Head! As you all know we are constantly striving to improve Clockhouse for your children. This year we are all working to 'Go Above and Beyond' to ensure our school is a fabulous place to be. 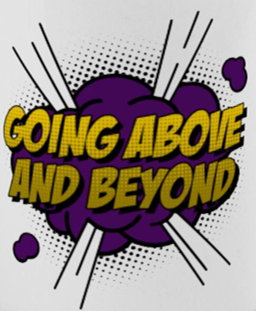 Each week, the Heads of Year as well as Mrs Pacheco, Mr Bottrill and Mrs Savidge will chose a person (child or adult) who has been seen to 'Go Above and Beyond'. Despite the hot weather the children were still very excited to come for the celebration and alternatives were offered. This week the following Clockhouse Citizens have been seen to 'Go Above and Beyond'. Reception - Harry A for trying so hard to improve his writing and helping others follow the Clockhouse rules. Year 1 - Ledion L for his amazing improvement and enthusiasm for reading. Year 2 - Denzel A-B for his positive attitude towards his learning. Year 3 - Joseph T for a great improvement in his attitude and being extra polite to others. Year 4 - Chloe R-P for showing great resilience whilst at school this week. Year 5 - Katie J for trying extra hard with her learning and showing great behaviour for learning. Year 6 - Jodie S for showing amazing commitment to improving her learning in the lead up to her SATs. Mrs Pacheco - Alex D for really pushing himself and showing amazing improvement. Mr Bottrill - Riley G for showing a great improvement in attitude in maths and grammar learning. Mrs Savidge - Harriet H for pushing herself out of her comfort zone during the classes Achievement Assembly. Well done to all these children and all the other children who have gone Above and Beyond this week. We are looking forward to Hot Chocolate Friday next week to celebrate with more fantastic people!